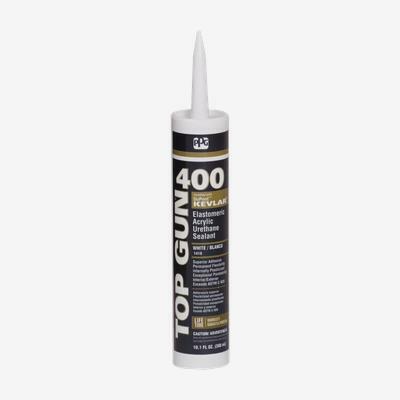 TOP GUN® 400 Elastomeric Acrylic Urethane Sealant is made with Kevlar® for exceptional strength and durability. This premium technology has exceptional adhesion to most building substrates with greater than 800% elongation. TOP GUN 400 is an internally plasticized sealant that reduces dirt pickup, eliminates yellowing and shiners. It forms a permanently flexible, airtight, water-resistant seal offering exceptional protection from environmental conditions. Where applicable, remove old sealant or caulking. Thoroughly dry the joints or surfaces, where the TOP GUN 400 will be applied. Remove all dirt, dust, oil, mildew, loose paint or other contaminants. Bare surfaces should be primed before caulking. Install backer-rod uniformly into deep cracks to control sealant depth. For cracks up to 1 1/2 inch wide, set the backer-rod from 1/4 to 1/2 inch deep. Bond breaker tape may be used for joints not deep enough for backer-rod. Cut nozzle at a 45º angle. Fill joints and cracks by holding the nozzle in the opening and filling completely from the bottom up. Cured bead should be between 1/8” and 1/2”. Smooth immediately with a damp sponge or towel, or other tool as required. Remove excess material with a wet cloth. Dry excess sealant may be cut away.